Labour has several reasons to be furious these days. 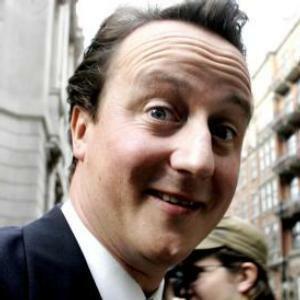 But, it has to be said, they’re being clever with that fury, and they’re doing it through dividing the Coalition Government anytime they can – now, by appearing to ally with Thatcherite Tory backbenchers. Part of Labour’s fury comes from the proposition, to be put to the Commons in the Autumn, to combine the Commons vote on adopting a referendum on AV with the proposition to realign the electoral district boundaries. Such realignment will largely dissolve what is (let’s face it) a northern urban Labour bias, and create districts with greater population equity – but at the expense of lots of Labour safe seats. So, it’s understandable from Labour’s perspective that boundary realignment is a bad thing. But, in arguing that they want to disentangle the Commons vote on boundary reform from a Commons vote on the date of the electoral reform referendum, what exactly do they want to accomplish? Separating the motion into two, and introducing a separate motion on electoral boundary reform, wouldn’t itself make a positive difference to Labour. An electoral boundary reform bill, alone, would (we think) pass in the Commons, no? The Lib Dems and Tories both express commitment to it. So is Labour’s motive to create obstacles for the 5 May referendum on voting reform? I think yes – but their motives seem indirect here. There are Tories who don’t want the public to vote on AV at all, let alone on the 5th of May when turnout is likely to be high, due to the coincidence of local elections that day. Labour’s motives here are more murky. They are half-ambivalent and half-supportive of voting reform, and Labour no longer maintains any predetermined opposition to AV. David Miliband would apparently welcome it, if he were leader, which he is supposed to be soon. So if it isn’t AV itself that Labour wants to scupper (though they might not mind if it is scuppered), what they really want to scupper is the Coalition itself. It’s just a brutal, wedge-driving, pot-stirring strategy: to generate early rifts in the Coalition, and to disenfranchise and disenlighten the Lib Dems over their solitary Big Win in this Coalition deal, which is the referendum itself. If the referendum date were to be changed away from the local elections date, and referendum turnout was thus rather low, provoking people like Bernard Jenkin to then advocate that the result isn’t conclusive enough, then Clegg might be provoked to abandon the Coalition. That would delight Labour, really. They must feel confident that they could precipitate an early election in 2011ish, if they pot-stir successfully enough between now and then. By next Spring, Labour will have a new leader, they’ll have the polling bounce that inevitably comes with that, and if the Lib Dems look disorientated and failed in not getting the AV vote on a day of their choosing, their wider support will be highly vulnerable. Labour is already hoovering up LD support, and it’s only July 2010. So while Labour have direct political reasons to oppose boundary reform, perhaps they have only indirect political reasons to oppose the timing of an AV referendum. Their tactics of late appear to be designed only to frustrate the Lib Dems, to kick them while their base is trembling and weak, to drive wedges in the Happy Marriage, and to set up a future election scenario that’s a highly comfortable and traditional bipartisan race. I’m hoping Clegg can pull this out of the fire… he’s already argued that a referendum on 5 May, coupled with local elections, would save the country £17 million. Which is more than will be saved by abolishing the UK Film Council, so it’s (in this new Age of Austerity) no mean sum. He may want to impress that upon Cameron, and get him (with some urgency) to ensure his backbenchers don’t indulge in Labour’s proposition to wreck the Coalition through wrecking the referendum. Of course I’m referring to a new blog milestone. Thanks, you thousand people! (or, you twenty multiple viewers). 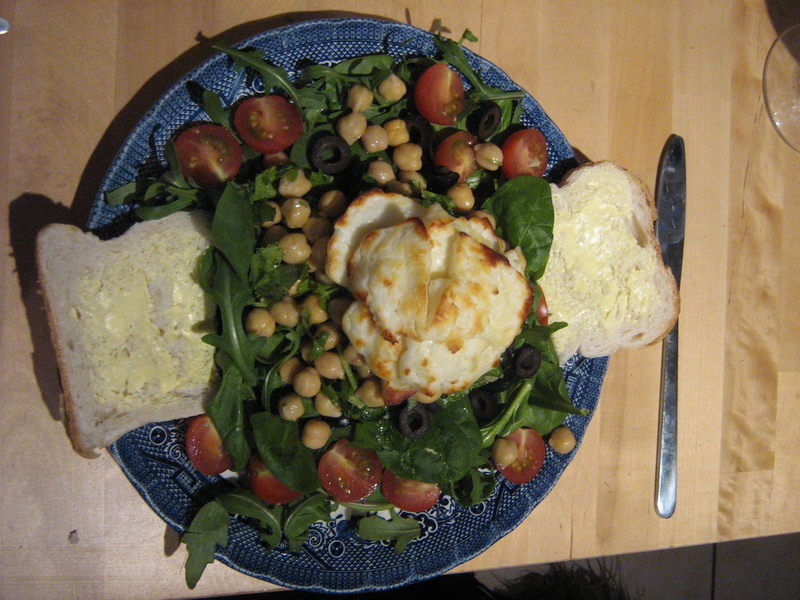 In celebration, here’s another (long-awaited, surely) photo of my dinner – a fantastic mid-week decision to go for halloumi salad. Squeaks ahoy! Who needs lights and cameras anyway? In terms of film, Britain is lined up to become more famous for the ubiquity of its CCTV than for its cinematic output – with the axeing of the UK Film Council today. The organisation, founded in 2000, had an annual budget of £15m to invest in British films and employed 75 people. Culture Secretary Jeremy Hunt said he wanted to establish a “direct and less bureaucratic relationship with the British Film Institute”. UK Film Council chairman Tim Bevan called it “a bad decision”. He said the announcement was “imposed without any consultation or evaluation”. “People will rightly look back on today’s announcement and say it was a big mistake, driven by short-term thinking and political expediency,” he said. So £15 million will be saved, or in other words, the annual cost of the Queen’s housekeeping. But what will be lost? Part of me worries that the Coalition Government has made this decision, not just to save money, but out of flat disregard for the quality, strength and visibility of British arts and culture. An ideological vision from the conservative right which suggests that any British filmmaker who’s any good should just make better films (and, if necessary, ask their folks for a loan). But then, maybe we shouldn’t worry – after all, we are now living in a Big Society. The government must trust that, by liquidating the national agency responsible for promoting and investing in the UK’s film industry, they are now empowering us. Now, independently organised collections of YouTubers and self-styled experts and critics can craft a volunteerist Film Council instead! We don’t need public agencies anymore: we just need the public, without any agency but spare time, to take up the slack left by a retreating state. Empowered by the Big Society, do I dare declare myself today the new President of what I’ll call The Real Righteous National Council for Awesome British Flicks? Anybody want to join? Fortnightly meetings at my local pub. Fish and chips, pints of ale, and big, big responsibilities. Good for these girls – it seems clear to me that they’re capable of standing up for themselves and aren’t ones to readily accept unfair treatment from a belligerent authority. 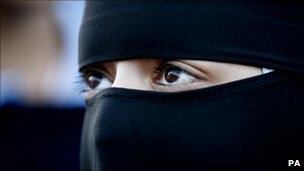 We should also see that confidence in their choices of what they wear, and why they wear it. She asked for his contact details but when he refused she began to film him and he covered his face. Just think, every bus driver in the whole of France now has the right – nay, the duty! – to behave like this guy. Vive la difference… or not. I’d like to continue this post, but the French approach to diversity vs. conformity causes steam to come out of my eyes. Maybe another day, we’ll go there. But for now, a plain old congrats to these two London girls for kicking up a fuss! It’s a horrible irony. On the fifth anniversary of this, the police also decide to announce this. On 22 July 2005, Jean Charles de Menezes was killed by police fairly deliberately, with seven gun shots to his head, while sitting on a Victoria Line train at Stockwell tube station. The rationale to shoot him dead, without knowing his name or his business, was little more complex than assuming that his olive complexion and black hair (in a neighbourhood full of Portuguese and Brazilian immigrants) were suspiciously Al-Qaedesque. Menezes had done nothing whatsoever to raise suspicions that he was a terrorist threat – this was bad police information, bad police protocol, and an “anything goes” police policy in place that summer after the London bombings. During London’s G20 meeting in 2009, Ian Tomlinson was also killed, though less deliberately, by police securing the summit. A newspaper salesman in the Bank area of the city, he was walking away from his kiosk after a shift -and walking away from riot police who were on guard. Perhaps the police suspected he was an anti-freedom, Gap-window-smashing anarchist, as everyone on the street was that day. Rather than ask him, police beat and kicked him to the ground and terrorised him with snarling dogs. Within half an hour, he had a heart attack and died. No officer at any level was held accountable for the death of Menezes, and today it’s announced that no officer will be held responsible for the death of Tomlinson. Physical assault and murder, whether premeditated or as tragic mistakes, are against the law and are punishable by anything up to life imprisonment. If I’d been assaulted or murdered on my street or in the tube, it would be a small comfort to think the machinery of our justice system would take its natural course – especially if the evidence of the attack is in place. Evidence such as video, and a clear identification of the perpetrator. Apparently not. Whether in the UK, or in Canada, we have this crystallising pattern of juiced-up riot police forces, acting far outside the boundaries of reasonable force, assaulting complete innocents and not seeing any judicial reprimand after the fact. It’s in the interests, not only of our hard-won civil liberties, but of the police forces themselves to: deal with their bad eggs properly, to submit to independent inquiry when adrenalised riot-protocol leads to such tragedies, and to go out of their way to correct instances of wrongful detention, assault, or murder. Anything less gives the real impression of an institutional culture of aggression and disrespect for the very law they defend. Despite that unexpressive, grey-play-dough demeanour about him, Stephen Harper doesn’t make life easy for himself. This being so, why does he continue to believe that the best way to implement policy is to do it outside the scrutiny of Parliament? Two controversial decisions in the past two weeks – 1) an untendered purchase of $18 billion state-of-the art fighter jets which we never knew we needed, and then 2) the axeing of the long form of the national census. It’s not just that the decisions were both bad – though they were – but it’s also the summertime, extra-parliamentary situation in which the government announced the decisions. It’s that unmistakable stench of sneakiness. The census move was a clear and simple sop to his hard-core, anti-government, Reform Party base. And we can’t be surprised he’s going to appeal to them anytime he can, because he comes from that base. He isn’t a moderate trying to woo the right-wing fringe: it’s absolutely the reverse. But wherever one sits on the debate as to whether a compulsory census is good or bad, there is a wider issue: that of accountable, consultative policy-making within earshot of critical Opposition parties. The government miscalculated in thinking that this is a risk-free time of year to reward the nutbar fringe without mainstream Canadians noticing. With it being summertime, and no Parliament in session, there must have been a logic in the Tory war room that Canadians in the centre and in the majority just “won’t notice” these decisions. Any mild controversy will die alone, while Canadians book flights and go camping. Why not procure billion-dollar stealth jets without any competitive bidding while we’re at it? Voters won’t notice or care. But, as Team Harper does so often, this has been a real miscalculation and misreading of the public mood. Canadians are already fairly sensitive to the view that Harper will try to slip fast ones by us at any opportunity – proroguation set that image in stone. So now, any big, sudden policy shift, outside the scrutiny of a sitting Parliament, actually rings real alarm bells for Canadians. Accidental Deliberations sums up perfectly the distended logic with which the Tories try to explain their decision to axe the census long form – hitherto the principal resource we have to really come to any factual grip about the nuanced state of the nation’s ever-changing demography. Tony Clement trots out a well-worn pseudo-populist argument that “less government inquiry” into the lives of The People equates to greater liberty. Simple! It’s a privacy issue, after all. And greater privacy is good for liberty (unless that privacy is misused for things like being gay or smoking dope. But I digress). This ultimate faith in the prenatural malevolence of public bodies is, of course, oh-so-Tory. But when positioned against its logical opposite, you get blind faith in the benevolence of private bodies. As it is with personal data. Never-you-mind that your credit rating, your shopping habits, and your seemingly private photographs of pub nights out are all happily entrusted to private companies over which people have zero democratic control. The real danger, apparently, is when public arms of government are entrusted with the information that helps design the public programmes we actually do depend on. Conspiratorial paranoiacs seem to warm to the idea that axeing the census long form equates to chopping off another tentacled arm of the state. Well, o.k. But prepare, then, to depend upon another tentacled creature to magically divine where we ought to build our schools, highways, hospitals, and all those other socialist nuisances that oppress us so. Senate reform or Reform Senate? If by reform he meant “Reform,” then Stephen Harper has delivered. But I get the feeling that most people expected that Harper was serious about creating an elected upper house, not on simply stuffing it with his friends – in a manner that exceeds the worst cronyist excesses of Prime Ministers past. By appointing his 34th partisan friend to the Senate, Harper’s generated a Senate majority for the Conservatives. It’s a majority that he’s conspicuously failed to achieve in the House of Commons, after three elections as party leader. Clearly he’s frustrated that he can’t be officially the boss of the room, so the irony is a bit biting – this erstwhile would-be “populist democrat” is only able to secure his deep-seated dream of political power through the patronage route – not through the route of electoral democracy. The irony is perfectly reflected in the appointment itself. Our new Tory senator, Salma Ataullahjan, is a failed Tory candidate for MP. The view seems to be: what you can’t win through elections, you secure through patronage. With that in mind, how open do you think Harper can really be to the concept of elected Senators? More democracy does not seem to generate more Conservatives. Ah, but these were the days! “Despite the fine work of many individual senators, the Upper House remains a dumping ground for the favoured cronies of the prime minister.” — Harper leadership website, Jan. 15, 2004. “Stephen Harper will cease patronage appointments to the Senate. Only candidates elected by the people will be named to the Upper House.” — Harper leadership website, Jan. 15, 2004. “Canadians . . . are ashamed the prime minister continues the disgraceful, undemocratic appointment of undemocratic Liberals to the undemocratic Senate to pass all too often undemocratic legislation.” — Stephen Harper, House of Commons, March 7, 1996. Ah, youth! Ah, idealism! Ah, duplicity and a corrupting lust for absolute power! Harper’s newly-friendly Senate met, obviously and by no coincidence, just in time to pass horrific legislation. The passage of last weekend’s omnibus “budget bill,” stuffed with unrelated poison pills that hadn’t passed in the democratic chamber but were added to this confidence motion, was obscene – not only a violation of any straight-faced concept of democratic accountability, but more galling, a violation of quite precise promises made by Team Harper thoughout his political life. Promises that got him elected in the first place (if barely). A big question to me is why conservative voters aren’t putting more heat on the government that they elected to deliver these promises. Aren’t they disappointed? Didn’t they feel such reforms were really important, and they thought Harper would bring them into being? There appears to be a real preference among too many conservatives to continue indulging in pitifully obsessive, collective attack-doggism against the Liberal Party – as though the Liberals continue to maintain a dark, shadowy control over the real levers of government. They do it through the civil service, and they do it through the CBC. They do it through sorcery and they do it through hypnosis. It’s a comic paranoia that’s not a million miles off from My Uncle Napoleon. As if Harper hasn’t been in power for a full four years, with more than enough time to be in a position to now take responsibility for what government has failed to do. What relevance “adscam” in 2010? None – but it’s an easier subject for the Right to grapple with, I suppose, than trying to digest the complex fact that their Reform-a-Tory leadership are effectively “out-Liberalling the Liberals” when it comes to crude arrogance, cronyism, and an aloof disregard for promises broken.